A ship or aircraft is spotted when another enemy ship or aircraft gets close enough to detect it, and if necessary for the type of detection, has line of sight (LoS). Surface Detectability Range: This is the range at which a ship will be detected by an enemy ship. A Line of Sight (LoS) is required between the spotting ship and the ship being spotted. A ship will not be spotted if there are no enemy ships within this range. Air Detectability Range: This is the range at which a ship will be detected by an enemy aircraft. This is usually shorter than the surface detectablity range. Unlike surface detection, catapult launched aircraft can spot enemy ships within 4 km of itself regardless of LoS, beyond that range they need LoS to the ship. Carrier based aircraft are not restricted by LoS at all when detecting enemy ships. All aircraft have a surface detectability range of 8 km and an air detectability range of 7 km. Launching torpedoes will not increase a ship's detectability range. Sailing slowly or stopping completely will not reduce a ship's detectability. Firing main guns will increase surface detectability ("bloom") to the current maximum range of the main guns. Air detectability will also increase by a smaller amount depending on the ship (and it is possible in this situation for air detectability range to exceed surface detectability, e.g König). Detectability will reset after 20 seconds. However, if the ship remains undetected at the moment of the bloom it will reset immediately. Firing AA guns will increase air detectability (but not surface detectability) by an amount depending on the ship. The detectability resets immediately when the AA guns stop firing. AA guns can be toggled with the P key. A ship that is on fire will have 3 km added to their detectability range (2 km by air) for as long as it is on fire. The increase does not stack with multiple fires. A ship's detectability range can be decreased by using certain upgrades, skills and camouflage. The bonuses from each of them can also stack together, so a Kagero (with base surface detectability range of 6.84 km) fully decked for concealment can have a surface detectability range of only 5.37 km. Another value is view range (sometimes called spotting range), which also doubles as a ship's render/targeting range. This is the range inside which other ships might be detected or spotted. It is indicated visually by the outer limit of the grey cone on the player's minimap in battle. No ship outside of this range can be detected by the player. 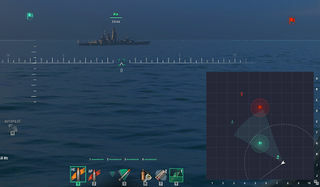 Allied ships and enemy ships spotted by others that are outside of view range are not drawn on the main screen but are displayed on the minimap as outlined icons. In general, the taller the ship the larger its view range. Battleships with their tall masts have very long view ranges (in excess of 20 km) while destroyers typically have the shortest view ranges. Aircraft carriers have unlimited view range. Aircraft (both catapult launched and carrier based) have a view range of 11 km. Generally, view range has little impact on ship to ship detection because it is usually higher than the detectability range of the ships being spotted. The only time view range limits ship to ship detection is when the spotting ship has a lower view range than the target's detectability range, such as a destroyer attempting to spot a battleship. In these cases, the target is spotted not at its detectability range but when it enters the view range of the spotting ship. Cyclones reduce view range for all ships on the map. At full effect the detection range is limited to 8 km. Radar increases detection range (to the same value as radar range) for its duration during cyclones but only for the ship using the radar. In the diagram to the right, assuming that all ships are enemies to one another, the destroyer (pink) can detect the cruiser (orange) as the cruiser is within the destroyer's view range (pink dashed line) and the distance between the two ships is smaller than than the cruiser's detectability range (orange line). However, the destroyer can not detect the battleship (blue) even though the distance between them is smaller than the battleship's detectability range (blue line) because the battleship is outside of the destroyer's view range (pink dashed line). The cruiser on the other hand can detect the battleship, as it is within the cruiser's view range and the distance between them is smaller than the battleship's detectability range, however the cruiser can not detect the destroyer even though it is within the cruiser's view range because the distance between them is larger than the DD's detectability range. The battleship can not detect either the destroyer or the cruiser even though the battleship's view range encompasses both of them because their distance to the battleship is larger than their respective detectability range. If the destroyer and the battleship are on the same team while the cruiser is on the opposing team, the destroyer will spot the cruiser for the battleship and it will appear as a solid icon on the battleship's minimap and be rendered in its main view. If the destroyer and the cruiser are on the same team while the battleship is on the opposing team, the cruiser will spot the battleship for the destroyer but it will only appear as an outline in the destroyer's minimap and not rendered in its main view. Smoke works by blocking LoS. If a ship is inside a smoke screen or have a smoke screen between it and all possible spotters, it can remain undetected even when there are enemy spotters within its detectability range. For air detection, smoke is considered as being at the same height as flying aircraft, therefore a catapult launched aircraft needs to be close to or over the smoke screen in order to detect any ships hiding beyond it. However, an aircraft can not detect a ship that is inside the smoke screen itself even if the aircraft is flying directly over the ship. If you fire your main battery then your detection radius will "bloom" outwards to a certain amount depending on your ship and if an enemy ship is present within that range then you shall be detected regardless of whether you are within or behind the smoke. Hence smoke is not a cloaking device. Hydroacoustic Search automatically detects ships and torpedoes at a fixed range when active, regardless of LoS. Surveillance Radar automatically detects ships at a fixed range when active. It does not detect torpedoes, but has a longer range than Hydroacoustic Search and is active for a shorter period. At 2 km ships will automatically detect each other regardless of LoS, making it possible for ships to be detected even if they are hiding inside a smoke screen or behind terrain. The ship upgrade Target Acquisition System Modification 1 will extend it permanently to 3 km. Ships can spot torpedoes from a fixed range based on the torpedo model. 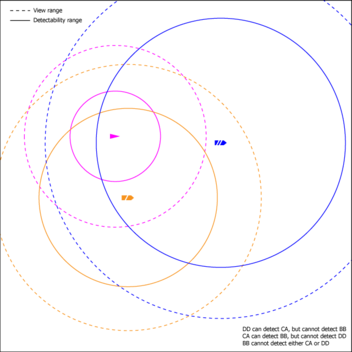 The detectability range of torpedoes by aircraft is half of this fixed detection value. The Hydroacoustic Search ( ) consumable temporarily increases the range at which a ship can detect torpedoes to a fixed distance. Once a torpedo has been spotted, it will remain spotted for the duration of its run. This commander skill displays a white marker indicating the approximate (22.5 degree sector) direction---but not distance---to the nearest enemy ship. That ship will be notified that their direction is being tracked. If you are detected by multiple means only the highest in the list will be displayed. This page was last modified on 23 January 2019, at 08:56.